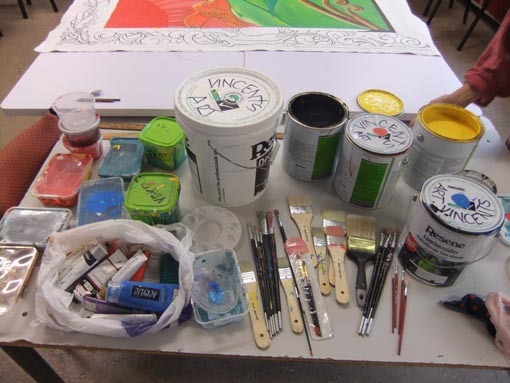 A conversation between Glen McDonald, Coordinator, Vincents Art Workshop and Ann Abraham, Prison Manager, Arohata Women’s Prison has resulted in a mural project at the Wellington prison. The prisoners are painting four large canvas panels, which will be hung to enhance the prison environment. With the groundwork laid, the project got under way at Arohata Prison in November 2012. Vincents Art Workshop is facilitating the project. 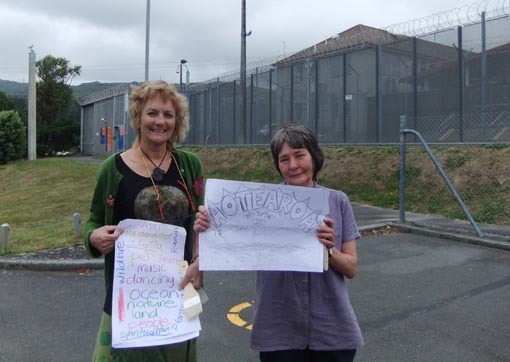 This is a diary of the project, with entries by Vincents’ staff members, Ann Abraham, some of the prisoners and Arts Access Aotearoa. When the first of the four murals was completed for Arohata Prison, a sense of achievement and pride was evident. All four murals have been brainstormed from the idea of “hope for a better future” – an idea to sustain the women before they return to the community. 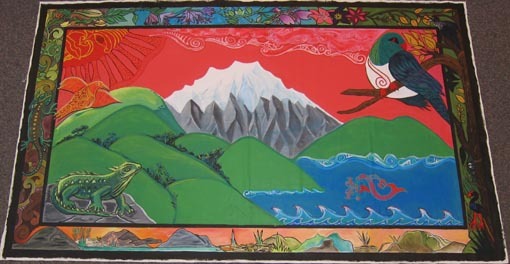 The first mural, called Nature and Animals, depicts a rural New Zealand scene with a mountain, open fields, native birds and animals. Framing the work is a border with dark bush and desert at the bottom, and a bright floral design along the top. 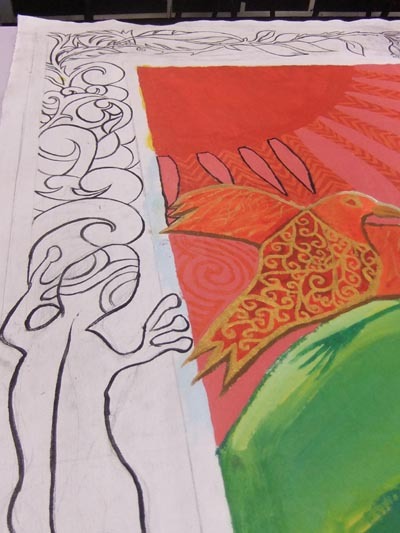 One of the women brought cultural values into the mural by overlaying a delicate lineal taniwha and sky. The women have learned about priming canvas, underpainting, layering, colour mixing, shading, line work and how to create a large artwork with a positive significance. We also gave advice and help to one of the women studying a Learning Connexion art course. As we came to the end of this first mural, we lost some of the participants to transferral or release, and progress slowed a little. However, as the women’s skill base has increased, their expectations and desire to achieve higher standards have meant they’ve become even more dedicated in their efforts. The skills learned along the way have gone beyond those required to create a large mural. The women have had to make a conscious effort to come with a positive attitude so they can work together as a team and create this type of artwork. They’ve come up with their own ideas on how to keep focussed. They’ve discussed and collaborated with each other, and have found common ground for the design and execution of this large work. They’ve learned that if they make a “mistake”, they can change or persevere with it until it’s resolved. Observing the women’s progress over the past nine months, I’ve seen how their confidence, listening, interpersonal and leadership skills have developed. 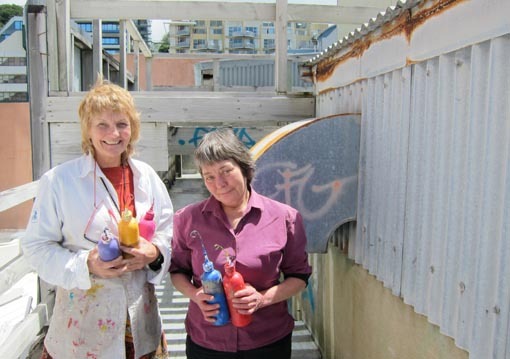 Two more women joined the group when work started on the second mural, which is called Aotearoa. 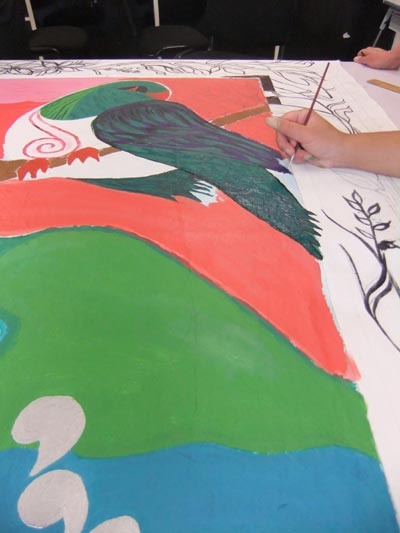 Enthused by what was achieved in the first mural, the women have started confidently, painting Ranginui and Papatuanuku into the central panel. 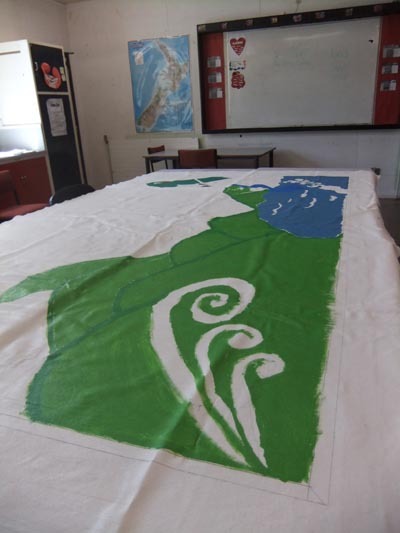 They are also painting many kiwiana images over a koru motif in the surrounding frame. This second mural promises to be the women’s unique interpretation of traditional and contemporary New Zealand culture. Arts Access Aotearoa asked one of the prisoners some questions. Here is what she wrote. Q. Why did you want to participate in the project? A. To be a part of a wonderful idea and to do something I truly enjoy; and an opportunity that will help other women want to achieve the same goals. Q. What are the key things you have learned as a result of your participation? A. It's important to be able to work with others, especially when you're working together on a project like creating a mural. You learn to know about others through their skills and passion. In this way you can express your true colours. Q. What are the key things that you most enjoy about the project? A. Being united with other women who share the same desires in their creativity. Being able to release our true gifts that allow us to shine individually. Showing our project to others and what we’ve achieved. Q. Do you think that you will continue with art when the project is finished? A. Yes, it is something that helps me deal with my day-to-day depression and has allowed the little child that was lost to become the butterfly (woman) who can be free. 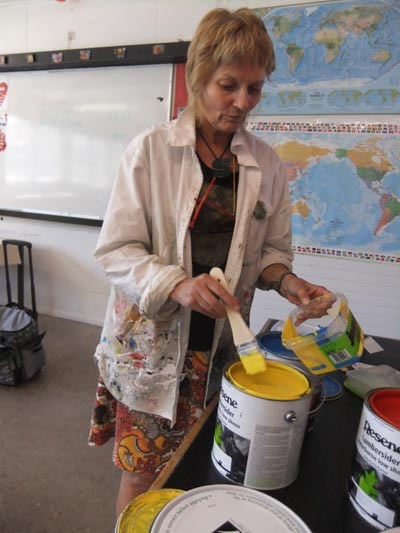 Jacqui Moyes, our Prison Arts Advisor, got the chance to do some painting on one of the murals being made at Arohata Prison and facilitated by Vincents Art Workshop. On her second visit to see how the mural project was progressing, Jacqui found a marked difference in the group and says the atmosphere was positive, collaborative, supportive, enthusiastic and industrious. A. Because I love anything to do with art. It's an awesome feeling being able to create this beautiful artwork and to put my talents to good use. I love the fact that we're creating a mural that will, hopefully, be inspirational and will put a smile on the other girls' faces. Plus it's something that will brighten up Arohata. Q. What are the key things that you have learned as a result of your participation? A. Well, I've had previous experience in the past, in terms of art and different techniques, but in terms of working with others, leadership, communication and talking about ideas, I found they are really important skills. You need to work with others you get along with, and make sure that everyone gets to have their say and have input into the project. Whatever mood you're in affects your artwork so you need to make sure you're in a good, positive mood to produce good, positive art. A. Creating something that will be a piece of history at Arohata, combining all our talents together and learning new things and, most of all, doing something I love and am passionate about. Q. 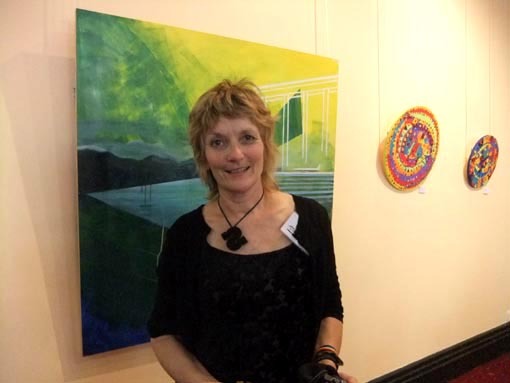 Do you think art can help the rehabilitative process? If so, how? A. Yes, I do think it’s a good way to be able to express yourself and it can be therapeutic as well. It can also be inspirational to others and have a real meaning behind the art. Q. Do you think you will continue to do art when the project is finished? A. Yes I do. Art will always be a part of my life. I enjoy doing it and I want to teach my daughter to become a better artist, and about all the different techniques that she can use in the future. Everyone can be an artist if they want to be. All you have to do is try. Large tins of paint – blue, yellow, red, black, white – sit on the table. Sandy* sees them when she comes into the room and says she can’t wait to start painting the mural after weeks of planning. She tells art tutor Shar and her colleague, Glen, that she was sick the previous week and is really happy to be at the class today. She unfolds a newspaper clipping, spreads it out on the table, and points to the photo and a heading that reads: “Don’t come back again.” It gives her inspiration, Sandy says. The next woman to arrive is Mere*. She apologises. She can’t come today. She’s got to work in the prison laundry because there’s a lot of work to get done. But she’ll be back next week. Two more women arrive to join Sandy. Like Sandy, they’ve been coming to the class from the beginning and are keen to get started. Sandy mixes yellow and blue to make green. “Who wants to paint the green?” she asks. “I will,” Renee* says. “I’ll do the hills.” And away she goes, her paint brush sweeping across the large blank canvas on the table. As well as the mural project, Tiana does quilting, works in the kitchen, takes bible studies and computer skill classes, does foundation education courses, and studies te reo and music through Te Aho O Te Kura Pounamu – the Correspondence School. Today I had the opportunity to spend some time with Shar and Glen from Vincents Art Workshop and the women creating our mural. The art tutor, Shar, supported by Glen, is very focussed and the women clearly enjoy the environment they create. The women tell me that their inspiration is personal and reflects their Māori heritage. It is by chance that the women involved are all Māori. There’s a smaller group today with some being released and others unable to attend for various reasons. However, you still get the feeling that everyone is engrossed in the art and giving 100% to the task at hand. The women explain to me that they have four themes: Aotearoa, whānau, nature/spiritual and multicultural New Zealand. They have drawn a scene on to a slide and are using an overhead projector to shine the image on to the canvas. I think that is an incredible idea and ask who thought of it. One of the women had come up with the idea and then they had all brainstormed to agree an appropriate image. They are drawing around the image to get it just right and the next step will be to paint the image. By this time I am also becoming quite excited about the work the women are doing. I can see a sense of achievement and pride on their faces. I note that one of the women, normally quiet and unforthcoming, is demonstrating excellent leadership skills, and the others are looking to her for guidance and confirmation of what they are doing. Two officers enter the room keen to see how much progress has been made. The women immediately show the officers what they are doing. The pride in their work is obvious and the officers become involved in a discussion about the images the women have created. Time for me to leave. I am very impressed with the way Shar and Glen have created such a comfortable environment for the women. The excitement of the women has rubbed off on me and I am looking forward to seeing the finished product. We could hear some beautiful singing of traditional waiata as we were going through security at Arohata Prison. It was a great beginning to our visit and it reminded me how the arts can transform a space and fill it with positive energy. 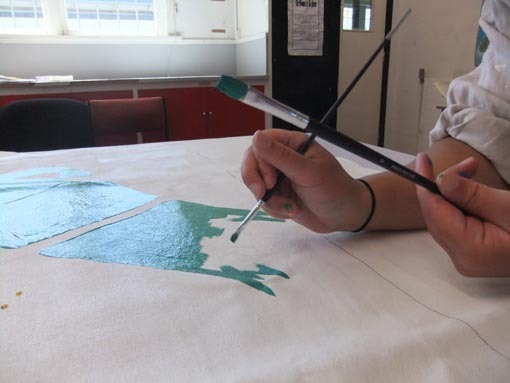 Taking part in this session of the mural project was really useful for me as Arts Access Aotearoa’s Prison Arts Advisor because it affirmed the direction of the arts planning process we’re assisting with for each prison. I found the session inspiring, and loved watching Vincents staff members, Glen and Shar, transform the space and tap into the prisoners’ innate creativity. Vincents and Arohata have taken on a huge project to create four large canvas murals over just a couple of months. Glen and Shar visit once a week for 90-minute sessions with up to six women. This was the fourth session and in the time I was there, they finalised the concepts for each of the four murals and started drawing on to the first canvas. One of the things about doing a project like this is the changing group dynamics in each session. No two sessions have had the same group of women although there’s a core group of three women. Glen and Shar did a great job bringing the group together and encouraging them to focus on the project. The women introduced themselves, talked about what keeps them going while they’re in prison and why they’re participating in the project. Checking in with each woman at the beginning of the session helped work through any tensions and encouraged a positive group dynamic. Then the women agreed on some key rules, including no swearing or gossiping; participating fully and being positive. Having a key support person from Corrections to guide me through the security, the language, management of the equipment and other issues I’ve had, has been beneficial. Setting the kaupapa and rules of the project in discussion with the participants means they take ownership and behave accordingly. Having two people facilitating the workshop sessions means they can bounce ideas off each other, both during and after each session. They’re also able to see more easily whether the session is actually working; whether the women are working together; and how each woman is responding to the project. At the end of the session, it was wonderful to see the women really taking ownership of the blank canvas and being excited, committed and positive, and looking forward to the next session. Four women came to this first session. It was a small group, which was good because it made it easier to get to know them in the time we had – 90 minutes. Before this project, I’d never been into a prison before and so I didn’t know what to expect. I was anxious that I might say the wrong thing but I soon realised that the women had a great sense of fun. I was also struck by how respectful they were and how keen they were to work on the project. The women seemed to enjoy the process and being given the opportunity for self-expression without their work or their thoughts being judged as right or wrong, good or bad. I really like the idea of them being given a canvas or a piece of paper where they can express themselves, explore ideas and get positive feedback. Art is a fantastic way to express emotions – joy, sadness, anger – and what we’re aiming to do is allow the women to paint from within their hearts. We did some exercises, which was part of getting to know each other. I’d brought in some coloured oil pastels and got them to write their names in a colour and start thinking about some of the things that are important to them; things that help them cope inside the prison. We thought that if the murals capture ideas of things that keep these women hopeful and positive about their future, then it might be helpful for others in Arohata. Children and family were the main things that came up: one woman said the thing that kept her going was thinking about her baby daughter. Gardening, nature, the bush, the sea and spaces were also things they said were important. What struck me about these women is that they are whole, real people who have made a mistake in their lives. The challenge will be moving from the ideas to the large canvases. In that first session, we opened up their thoughts and feelings and as new women join the group, we’ll need to work with them as well. So that might be another challenge. I don’t know. As art tutors, I think we need to be flexible and responsive. It’s about building up trust – in us and in themselves. Actually, that’s how we work at Vincents. The difference there is that the artists tend work on their own project while in Arohata, the women are working on a large, collaborative project. We have to buy the canvas and materials for next week. I’m really looking forward to the next session. Today I had my third visit to Arohata. With each visit, it feels more comfortable. The first time I went into the prison, it was a bit of a culture shock, I guess. It was a new experience for me and I was very aware of the unfamiliarity – like having to go through high security and needing a photo ID. On my first visit, I met with Ann Abraham and we talked about what we hoped to do and what materials we’d need. I was given a guided tour of Arohata and met some of the staff. I was also able to talk to some of the women in the library. I told them about Vincents and about the project. They seemed really interested. On my second visit one of our art tutors, Shar Young, came with me so she could have a look around. We visited the Drug Treatment Unit and the women were outside in the quadrangle. They spontaneously sang us some waiata. It was lovely. With our third visit, Shar and I attended an orientation session where a prison officer went over rules and behaviour. It was pretty straightforward. He talked about things like not accepting gifts, not making phone calls for the women, not touching anyone apart from a handshake … One of the things that was good to hear was about respecting everyone and treating everyone the same. It’s really just common sense and also how we work at Vincents. But it was good to hear the prison officer say it so we’re very clear about the expectations. Apart from having to go shopping to buy the materials like canvas, paints and brushes, we’re ready to go. In the first session, we’ll be talking to the women about their ideas and developing a theme or themes of what they’d like to paint. We can’t wait to get started! Original generation time 1.5928 seconds. Cache Loaded in: 0.0006 seconds.